This King James Bible music offers twenty eight Bible promises, and many Psalms, which each family member can enjoy. The music is simple which gives emphasis to the Bible passages sung. Features female lead vocals and guitar. All lyrics from the King James Bible. "We now have all of the CDs and the music has been, and still is, a great help to us in our Christian walk. Thanks so much for being devoted vessels of Jesus to do this." U.S.
"My family meets with about 6 or 7 other families in a home, where we fellowship on Sundays and have a meeting of believers, or church as most call the assembly of believers. We sing and play the Scripture Songs often, along with other hymns and songs. They really add a peace and enjoyment to our time of fellowship. Thanks and God Bless all of you!" U.S.
"I have your Scripture Songs I and love it. Praise God for your excellent work. A great way to memorize KJV verses. My 2 and 5 year old memorized a song for VBS from your CD!!" U.S.
“The music is wonderful! I am so excited to use it. 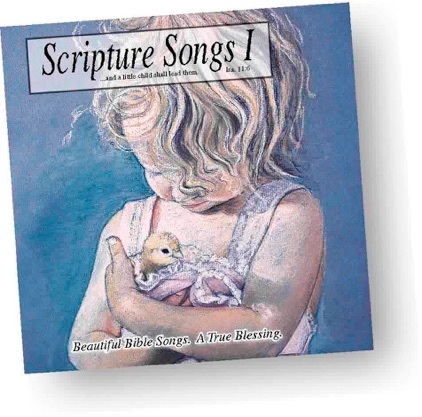 We learn a new memory verse each month in sunday school and we are going to use the songs. It is so much easier for the children to learn the verses when they are to music. Thank you so much.” U.S.
"No words can express the gratitude I feel for this pure, sweet KJV Bible music. I keep giving away my copies as gifts, so I need to get some more. Thank you! U.S.